As a unique addition to your wedding reception or in lieu of the traditional guest book, consider a bowl or jar for blessings and wishes. 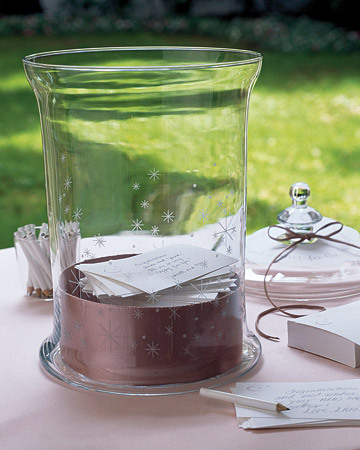 Guests can write sweet notes to the bride and groom on small slips of paper and place them in the bowl during the event. These memorable memos can be read later by the couple, and will remain a lasting treasure to them. Keep in mind that this idea could also be applied to baby showers, bridal showers, birthdays or graduation parties! Before my hubby and I were married last September, we received a Blessing Bowl as a bridal shower gift. 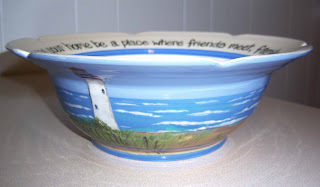 Our bowl was hand thrown from clay and hand painted with a scene of the beach and lighthouse in Cape May, NJ where we were married. 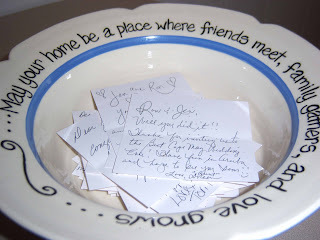 By the end of our reception, the bowl was full of well wishes and advice from close friends and family. The bowl now sits on our kitchen table as a special reminder of our wedding day.